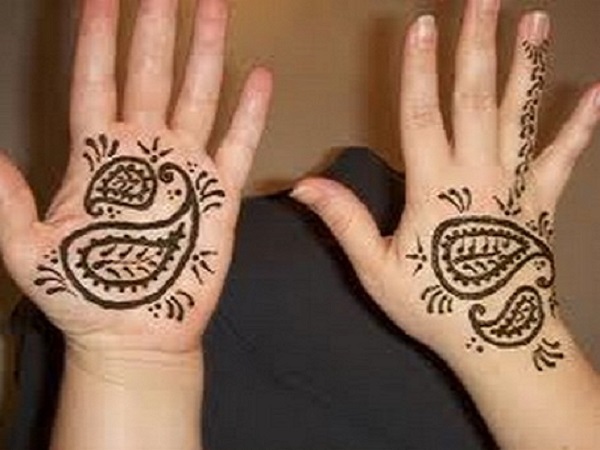 During weddings and traditional functions we generally apply mehndi with a lot of elaborate designs. However once in a while it feels good to apply simple mehndi designs which not only take less time but also give a clutter-free look. Given below are some easy designs which you can try on your own. 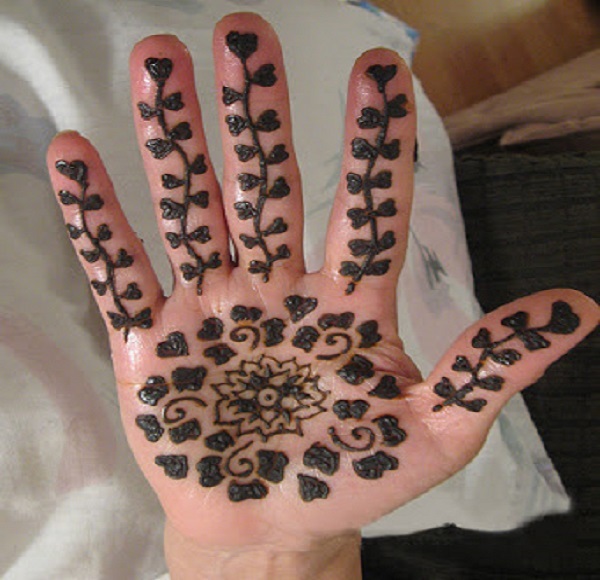 This is probably one of the easiest mehndi designs to make. 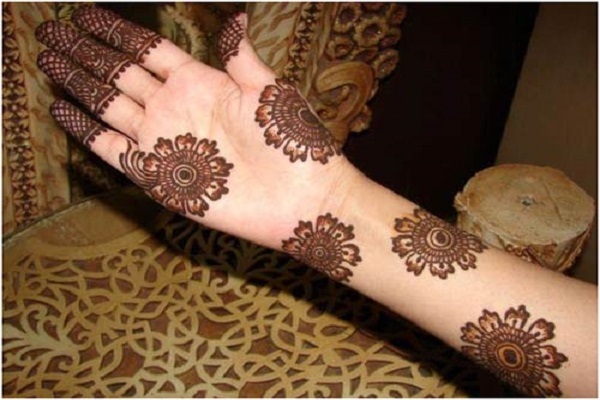 A blob of mehndi is placed in the center of the palm which is surrounded by ever increasing circular patterns. Tiny dots and lines on the fingers complete the design. 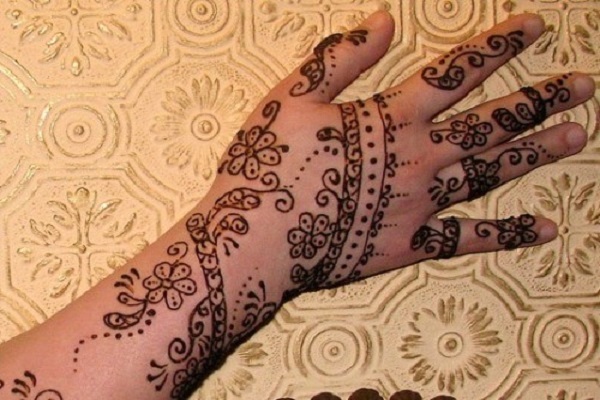 This traditional design comprising of flowers and leaves looks quite stylish. 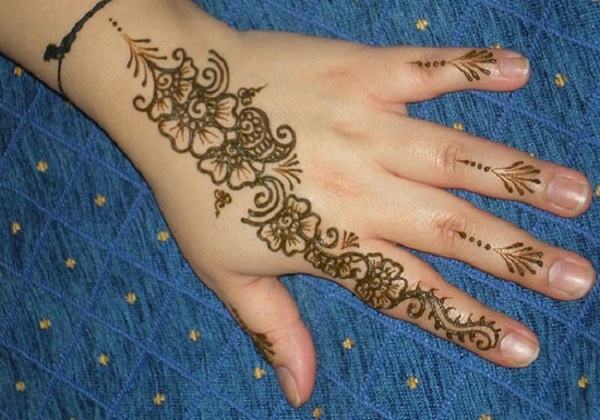 This design which extends from the wrist towards the forefinger comprises of a number of flowers interconnected with each other by spiral figures. The detailing of the petals and the lines on the fingers further enhances its looks. If you want something different than the regular flower motif then this is the right design for you. This noteworthy design doesn’t involve the use of any complicated patterns, rather thick broad lines coupled with semicircular designs and dots complete this geometrical look. This design will look good on trendy outfits. This extremely striking design is so simple yet so elegant and arresting. A bride opting for this design will definitely turn heads at the uniqueness of it. The spiral design which begins at the toe goes all the way to the ankle where it ends in the form of an anklet adding to its beauty. 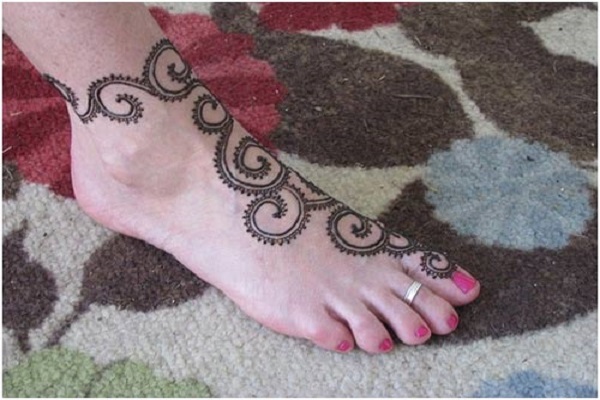 This is a very pretty and unique design where the mehndi is applied to the sides of the feet. The mainstays of the design are the two broad lines extending from the sole to the toes which are rounded off with tiny motifs and simple strokes giving the design an elegant look. This design is quite simple to make as there are no complicated forms involved. Straight lines surrounded by semicircular patterns that culminate in a bangle form at the wrist makes this design a pleasant one to look at. 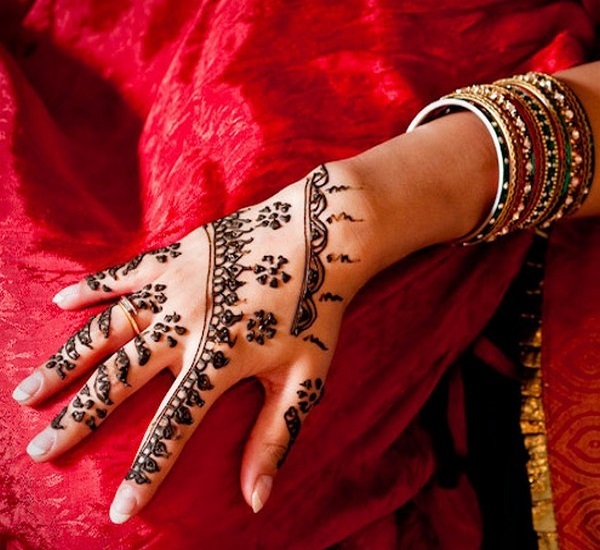 The shape of the design in fact resembles the jewelries worn by a bride on her hand. If you are fond of floral patterns, you will surely like this style. This design with floral patterns is an easy one to make. Use large flowers to fill up your hands and as and when required you can incorporate dots and spirals to complete the look. Kids generally have a short attention span hence this design is apt for them. Two large paisleys complete the design which can be applied within a matter of minutes. This design can even be applied on the back of the palm. This simple and stylish flower design is quite an easy design to apply on one’s own. The fingers are intricately carved while the rest of the hand is kept free to accommodate these large and beautiful flowers. 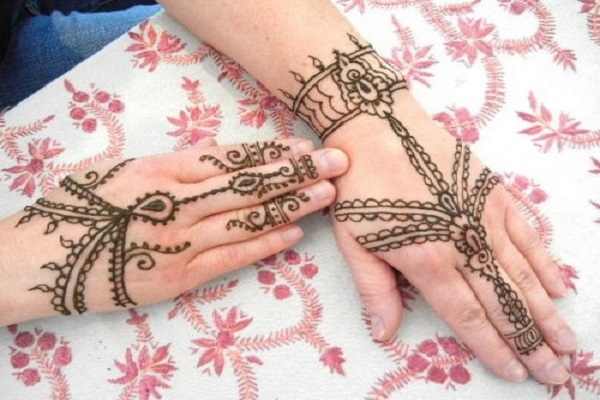 This design will look well on the hands of a bride who wishes to keep things simple yet classy and unique. 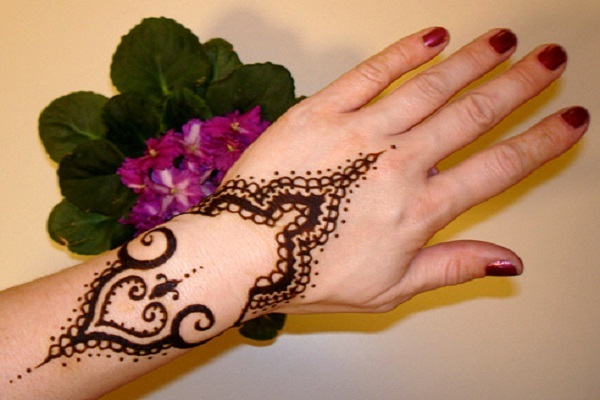 This design is very easy to apply and suitable for working women who do not like the idea of wearing heavy mehndi on their hands. 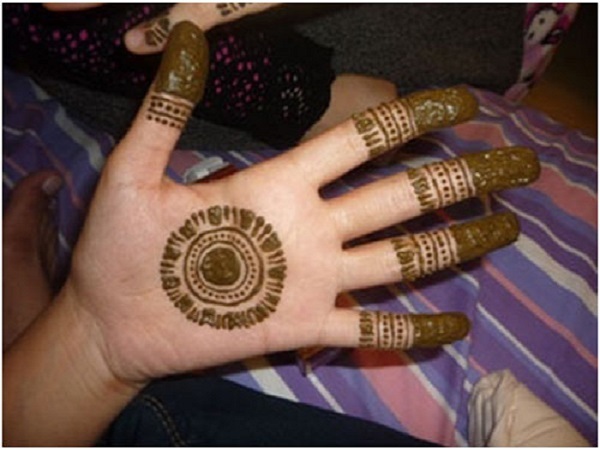 Here mehndi is applied only around the finger tips in a circular manner. You are definitely going to make a style statement if you sport this design. This is another of those simple designs which can be applied quite easily. A single flower dominates the hand while the fingers are taken up with minute crisscross patterns adding to its charm and beauty. This classy design with the design concentrated on just two fingers makes the fingers seem longer and graceful. The paisley pattern is always a super hit and this design is based entirely on it. Tiny paisleys fill the fingers which culminate in a bigger paisley which has been given the shape of a flower. This design might look a bit difficult but in actuality it is nothing more than a large oval encrusted with several tiny motifs. You can add just about any design to fill out the space. 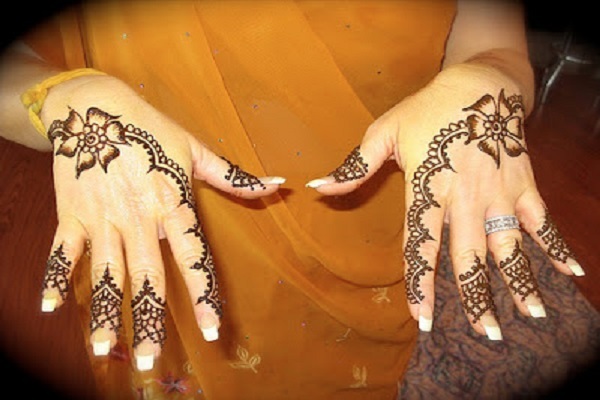 The fingers look beautiful decorated as they are with lovely leaf patterns. 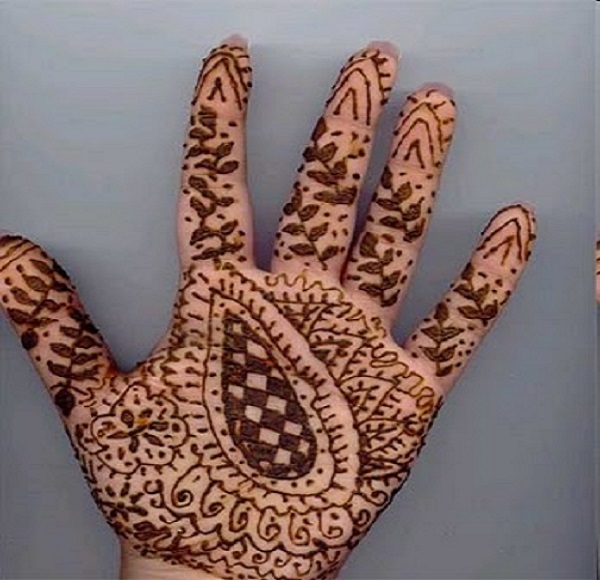 This is a very simple design which can be attempted by almost anybody wishing to try their hand at mehndi. This beautiful design has a lovely flower at the center and the fingers are designed with stem patterns with the leaves replaced by tiny hearts. This design for the back of the hand is an extremely elegant design. The main pattern is that of an anklet where tiny dots and semi-circular patterns complete the delicate look. This is a good design to wear for an engagement ceremony – simple yet stylish.